While it is typically true that there are generally three options available to debtors in a chapter 7 bankruptcy with regard to their autos, there may in fact be a fourth option. In a chapter 7 bankruptcy case the debtor has the ability to reaffirm, redeem or surrender and auto. A fourth option which seems to be making a comeback is the good old retain and pay or ride-through option. Let’s examine these options. The most common option for a debtor is to reaffirm the debt on a vehicle. This option allows the debtor to retain the vehicle through the bankruptcy and be obligated for the outstanding balance after the bankruptcy. Provided the debtor is current on his or her payments pre-petition, the lender will typically issue a reaffirmation agreement to the debtor’s counsel. That agreement needs to be executed, submitted to the court and it is subject to approval by the court. In certain circumstances, the court will hold a reaffirmation hearing to determine whether or not the agreement imposes an undue hardship on the debtor moving forward. In most instances, the debtor is allowed to retain the vehicle, the reaffirmation agreement is approved and the debtor continues to make his or her monthly payments on the vehicle just as prior to filing bankruptcy. The second option is to redeem the vehicle. In this circumstance, the debtor will pay the fair market value to the lender in one fell swoop in order to keep the vehicle. Since the debtor typically does not have the funds available to pay off the market value to the prior lender, a secondary lender comes in under section 722 of the Bankruptcy Code and provides such funding. The debtor can sometimes get a better deal from the second lender by only being obligated to repay the fair market value of the vehicle at a decent interest rate. This is not an option that is elected often because it just doesn’t seem feasible in most cases. The debtor would have to acquire secondary financing for the fair market value of the vehicle and a decent interest rate to make it worth his while. There are companies that specialize in this type of secondary financing however in my experience we have not seen great success. These secondary lenders try to lowball the value of the vehicle to make a profit for themselves. In my experience, only a small percentage of vehicle debt ever gets redeemed in a chapter 7 bankruptcy case. The third option is simply to surrender the vehicle in satisfaction of the debt. Many debtors take advantage of this scenario when the vehicle is either completely upside down or in tremendous disrepair. This allows the debtor to give back the vehicle and look towards purchasing a new vehicle after the case is filed. There are so many opportunities from different lenders and dealerships to get into a vehicle post-filing that many debtors are willing to let go of their current vehicle if they are either upside down or the vehicle is not functioning properly. Let’s talk about the fourth option. What I’m referring to here is the ride-through or retain and pay. This was an option available to debtors prior to the bankruptcy reform of 2005. Since that time, the only lender that I am aware of that specifically will not allow this fourth option is Ford Motor Credit. They stick to the true letter of the law and force the debtor to either reaffirm, redeem, or surrender. In fact, when their counsel sends a reaffirmation agreement, there is a cover letter that specifically states that Ford Motor Credit will not allow a retain and pay scenario. Other lenders however, are hesitant to even send a reaffirmation agreement because they want to avoid the additional expense and hassle of a potential reaffirmation hearing. 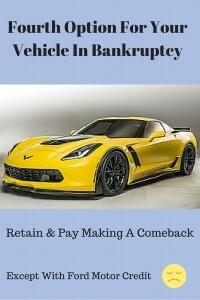 Those lenders simply understand that if the debtor wishes to maintain the vehicle, he must continue to pay for it. If the debtor fails to make payments post-petition, the lender has the ability to repossess the vehicle, sell it at auction, absorb their loss and move on. In the long run, they save some money because they don’t need to engage in legal fees every time a chapter 7 bankruptcy case is filed when one of their vehicles is financed. So although technically not allowed under the bankruptcy code since bankruptcy reform, this fourth option to retain and pay, otherwise known as ride-through, seems to be making a strong comeback. In my opinion, it makes perfect sense for the lender to just allow the debtor to retain and pay. If the debtor defaults, the lender has its remedies.